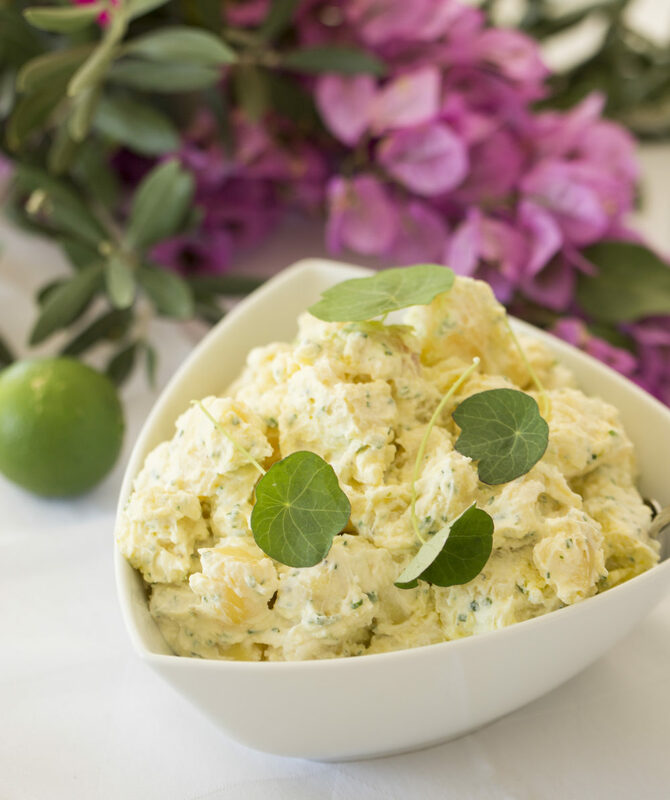 The tangy yogurt cools the palate with this gluten-free potato salad, making the yukon gold potato salad a good partner for spicy barbecue. Peel the potatoes, then put them in a pot and cover with 2 inches of water seasoned with 1 tablespoon of salt. Bring to a boil, lower to a simmer, and cook until fork-tender, 20 to 25 minutes, depending on size. Drain and let cool. Cut the potatoes into ¾-inch cubes. Meanwhile, in a serving bowl, stir together the yogurt, chives, 1½ teaspoons salt, and pepper to taste. Gently stir the potatoes into the yogurt dressing, season to taste with salt, and serve.